I really, really like your widget. Skip/pause options are very nice. I just wanted to add my praise to the posting. Any widget that lets me listen to BBC World Service and then That Mitchell and Webb Sound is amazing in my book. Seriously, your efforts are appreciated! Improvements are looking good too. What a wonderful widget. I've had so many problems with browsers crashing trying to play BBC radio... and this worked first time! Goodbye New Zealand commercial radio forever! Many many thanks for your efforts. Love the widget, but today, the directory for BBC7 did not come through, just the Listen Live, which works. Other stations seem to be fine. 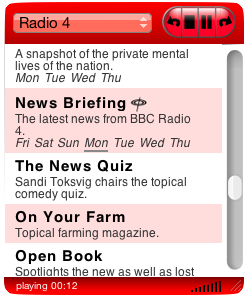 Looks like the BBC are moving from the old radio player on which this widget relied to a new player. Not sure if the service will come back (hope so but no promises) but stay tuned! Problem is "Spreading" Radio 3 is now AWOL too. Let me know if you need a tester/hand with anything. Hi! I have always loved this widget but am having problems with the 3.2. I have RP 10.1 installed. I do not get the list of programs associated with each channel - for instance BBC only has "Listen Live" in its list. It seems to me that the BBC is moving listen again radio from the old radio player to the new iPlayer, hence the recent lack of station listings.